At age ten his father took him to a performance by the BlackWatch Pipes and Drums and his love of the Great Highland Bagpipe began . .J.V. also plays the Scottish small pipes, tin whistle accordion and the doumbeck. JV Hudson has had the honor of piping for the opening ceremonies of the Coca-Cola 600 (2009) , The Jim Valvano Kids Klassic (2009) , The Green Brier Hotel, The Sprite of Norfolk and many other venues and events. From day-wear to black or whit tie , to full military dress ( with insignia in proper location), JV has the uniform and talent to make your event one to remember . A professional with great class and very easy to work with during rehearsals and warm up. He played very nicely, was flexible, and friendly. I highly recommend his musical and astute approach to the literature. 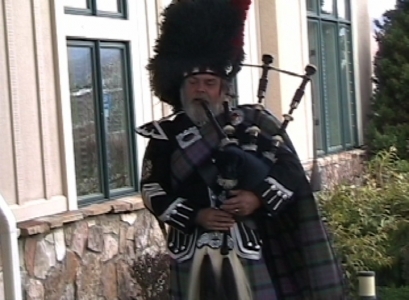 He made a very memorable impression on our congregation's St. Patrick's day service. scare . Very nice to meet you and your lovely family and the friendly people of the church . Hope to see you again , good health , happy playing and God Bless ! 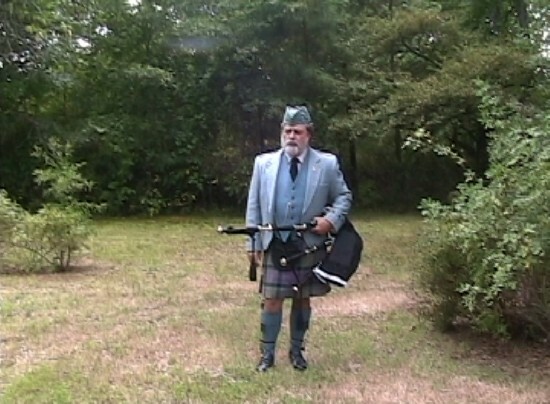 Look no further - this is the best Bagpiper in NC!!!! I had a small St. Patrick's Day Party at my home and booked Jerry to play. Not only is Jerry one of the most gifted Bagpiper I have ever heard, he also has a wonderful and friendly personality. My guests just loved him....He was the hit of the night and made my party a huge success!! I would recommend Jerry to anyone...in fact, I will be booking him again!! Five Stars Means That It Was Great. Mr. Hudson was polite, on time and professional. His music touched everyone's heart. A lot of comments on how beautiful it was. I wouldn't trade it for anything. Robert Gregory. J.V. Hudson was great to work with! Communication was quick and easy. He was flexible when Hurricane Florence led original event to be canceled and rescheduled. J.V. Hudson brings an amazing grace to our church! J.V. Hudson brought his seasoned skills as a master of the pipes to our church service. He played as he led the opening processional (the choir and minister) into the church. He also played the offertory and the recessional. His music was breathtakingly beautiful and perfect for the last sermon of our former minister--who has deep roots in Scotland. J.V. is a professional musician in every sense of the word. He arrived ahead of schedule and seemed to instinctively understand his role in the service and the timing of our order of worship. After the service, he mingled with our congregation with equal grace, answering every question about his pipes and his musical background. We are very happy indeed that we found J.V. ; for absolute certain, he will be returning to play for us in the future. J.V. might have come as a stranger, but he left as a friend! J.V. 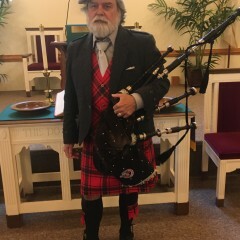 was prompt, dressed appropriately for a funeral, and provided inspiring music from “the pipes” exactly on que. we received many great comments with the most common being Doug (the deceased) would have loved the pipes! The only negative comments (if you can call them negative) were “I wish he would have played longer! We had very high expectations for J.V. and Mr. Hudson far exceeded them! If you need a piper, J.V. Hudson is your man! J V was outstanding, very personable. The Birthday Celebrant, a 90 year old lady of Scottish descent loved it and was thrilled. Thank you very for a great highlight to our party. J.V. 's performance exceeded our expectations. He was also a good communicator prior to the event and left nothing to the last minute. Our family would definately use his services again. Mr. Hudson came to perform for my grandmother's funeral. My grandmother loved everything Celtic and she could trace her Scottish heritage back for centuries. Mr. Hudson came early and went over everything with us. I had contacted him on very short notice asking him to play two songs during the memorial service. The songs were beautiful and he was very professional. My grandmother would have enjoyed it. The planning and prep with J.V. for my Dad's surprise 86th birthday celebration was timely and professional. The look on my parent's face when they heard J.V. playing outside was magnified when he played his 2nd piece right there in the dining room. My Mom, ever the stickler for detail, said J.V. looked great and she particularly appreciated his attention to detail in his attire and instrument. She noticed everything. Meanwhile, my Dad was in heaven, listening to the melodic sounds from J.V. and his bagpipe. I highly recommend J.V. to anyone interested in a top-notch performance. JV went out of his way to make our daughter's wedding extra special! 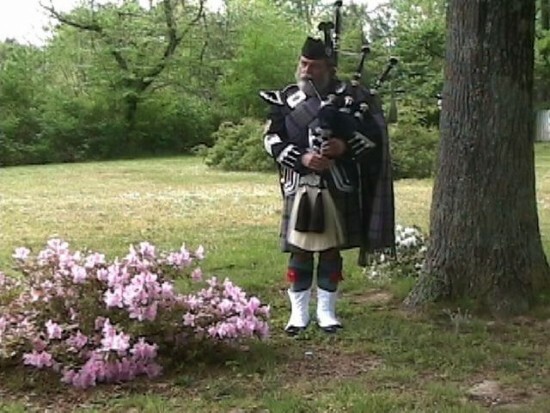 He was the "surprise" of the ceremony and walked out of the woods playing his pipes for the processional. Many thought it was a CD, until they saw him coming from the lake area in his full Highland regalia! We were able to hear his playing all the way up at the house when the bride was waiting for the carriage, and it certainly sent chills up the spines of many. He is professional but easy to talk to and you can tell that pipes are his passion! 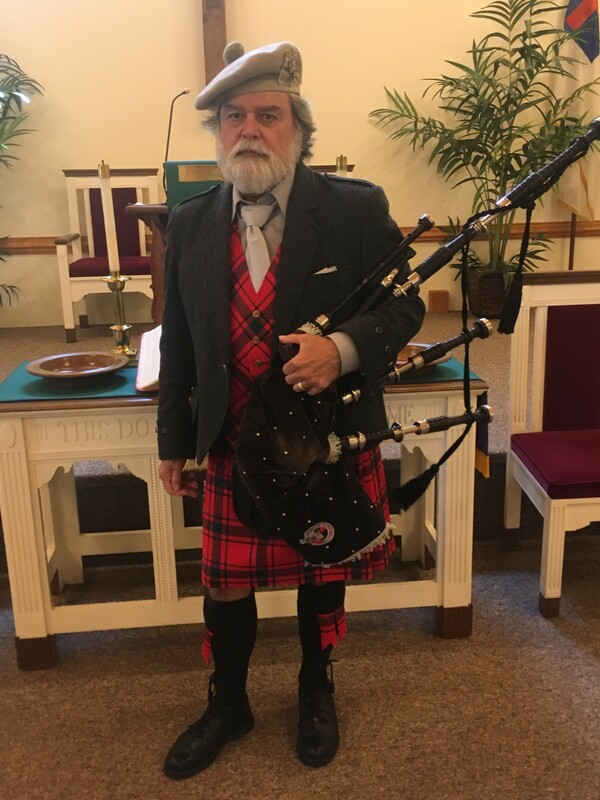 He helped us choose the music and made recommendations that suited the occasion, Brian and Kelley's personality, and the addition of bagpipes made the wedding exceptional. JV Hudson provides an exciting performance of Scottish and Irish music on the Great Highland Bagpipe . With many uniforms to choose from . Simple tweed day wear to full dress military with feather bonnet . History of the Highland bagpipe and the great Clan Donald of which he is a member . Recent review: Robert was very professional and he interacted with the guests while walking around and playing.